As you know I’m spending the summer working with Homebase on a makeover for my garden using their garden on a roll product. 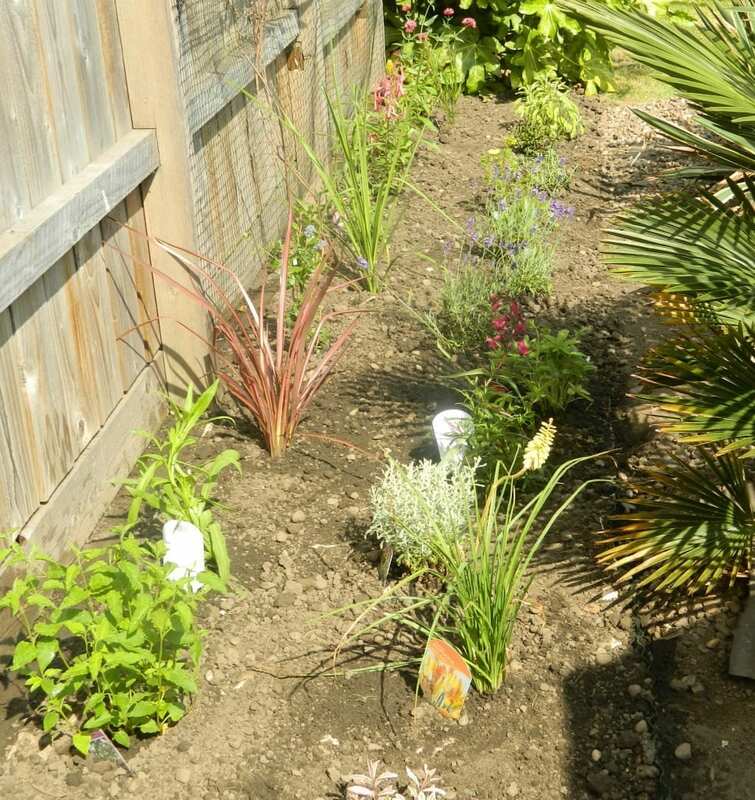 After several years of neglect the garden was looking tired and unloved, and definitely needed an injection of new plants, colourful flowers and lots of hard work. I’ve written about the state of the garden, and also about my plans for a Mediterranean theme and so here’s where I start to show you how the garden transformation is taking shape. Homebase asked me if I would like to try out one of their newest products, the Garden on a Roll as part of the garden makeover. 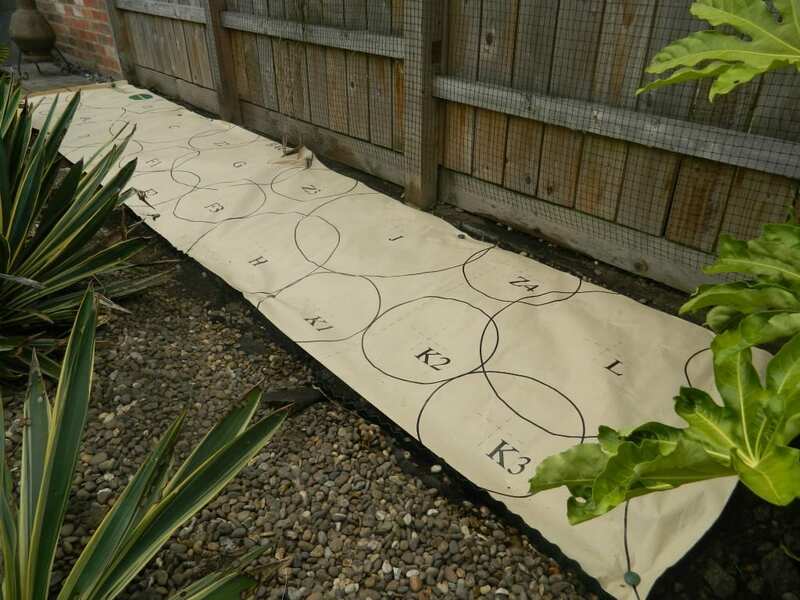 Garden on a Roll is the ideal way to create the perfect border, and is a great way for novice or inexperienced gardeners like me to get a professional looking garden border. Your chosen themed plants arrive in a box, along with a border layout map, some tools and a DVD with instructions. I couldn’t wait to give this a go. Firstly I needed to decide in which part of the garden I was going to create my border, and how big that area was. 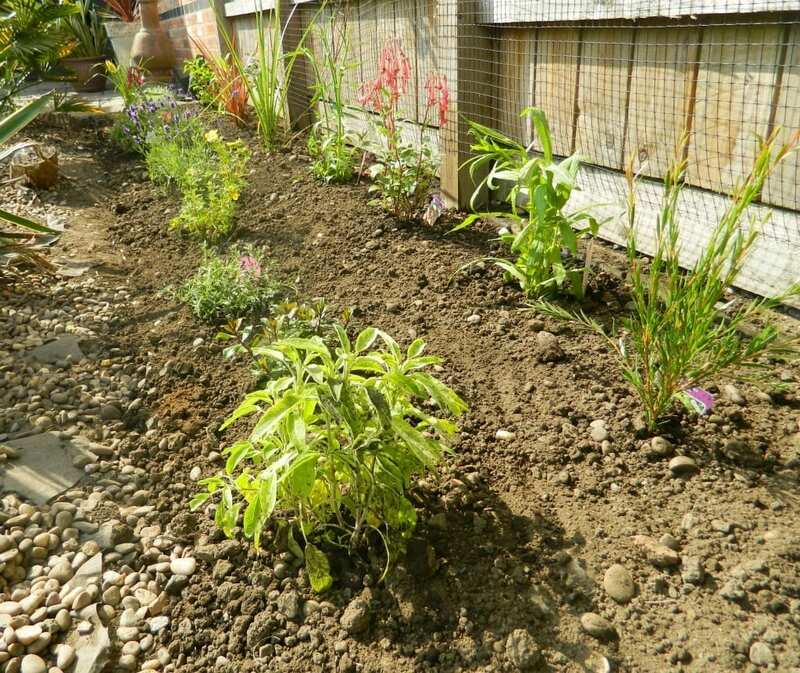 At the side of my gravelled ‘hot bed’ seemed the ideal spot, as it was nice and sunny and up against quite a bare fence that needed some covering. The space was 5 metres long by 90cms wide which whilst being quite large, would provide some much needed interest in that part of the garden. The Garden on a Roll product is available in many different types to suit your style of garden and the location of the border. 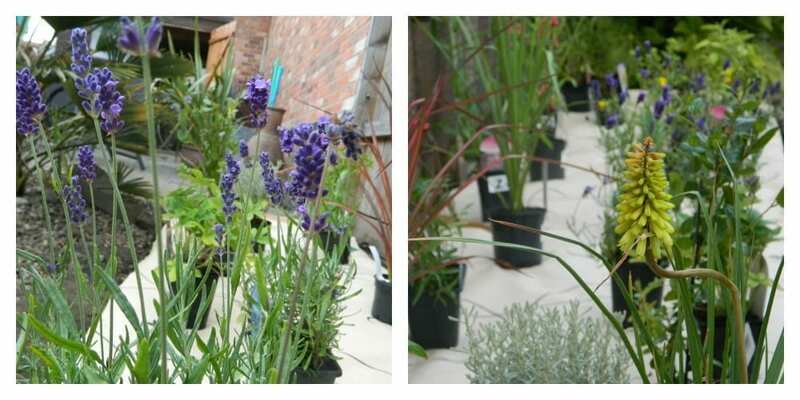 For example you could choose from Sensory, Shady, Mixed Sunny, Bee and Butterfly, Evergreen, Mediterranean and Chelsea (that follows the Homebase Gold winning garden from the Chelsea Flower Show). For me, of course the choice was straightforward and I went for the Mediterranean border to fit with the garden makeover theme. Now here’s what impressed me the most. I got a phone call once the order had been placed, from the Garden on a Roll people themselves asking me a few questions about the border, and discussing the best time to deliver the box of plants so we would be ready to plant them. It gave me the chance to ask a few questions too, and felt like I was getting a really great service from a big DIY company. Now I do know this is standard practice for all customers and wasn’t just because I’m reviewing the product. 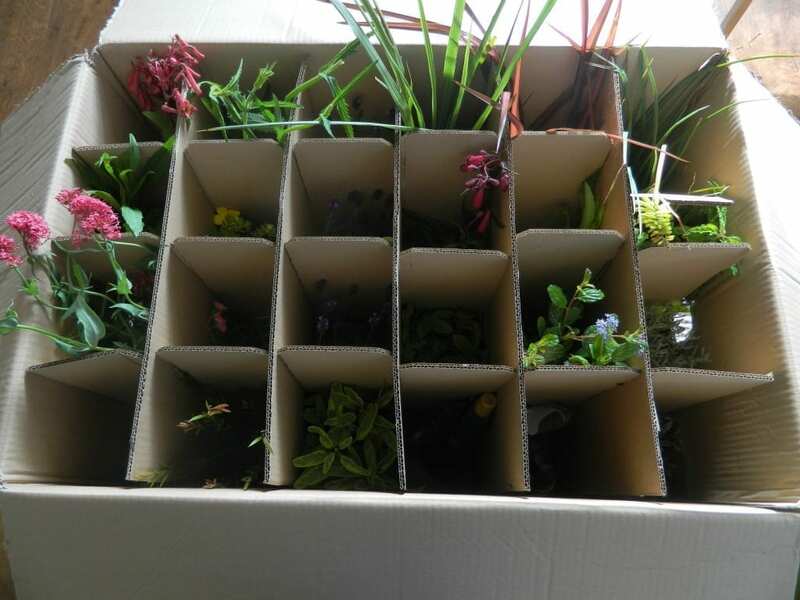 So the box of plants arrived on the day we arranged, ready to be planted over the next few days. 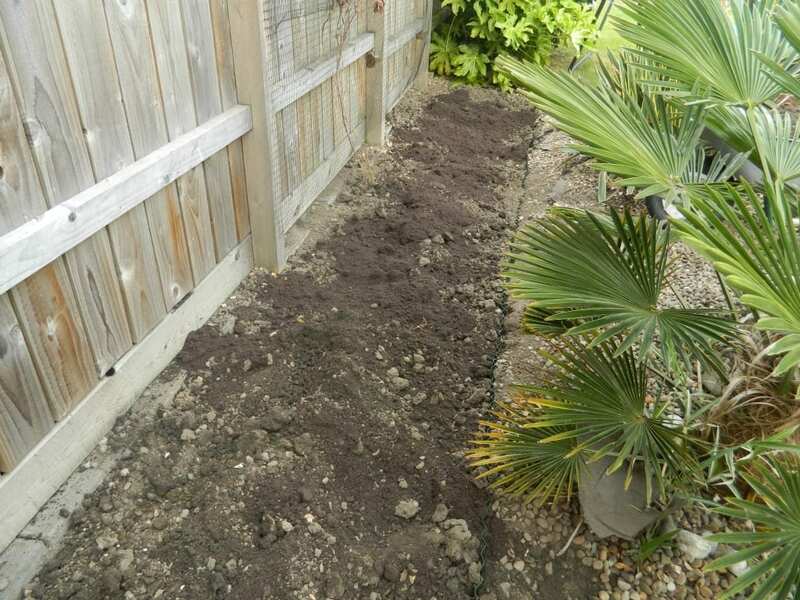 And so we created and prepared the border area, digging it over really well, adding some edging and some topsoil too to enrich the soil. That was the hard bit to be honest and now we were ready to put in the plants. So it’s really simple to create the border once the area is prepared. Layout the biodegradable paper plan and put in the pegs to secure it. And that’s it really, simple. Water really well for a few weeks and then at least 3 times a week after that. It’s been really hot here so some days I’ve watered twice to keep the plants looking healthy. Fingers crossed they all seem to be doing really well and many are now flowering and have grown lots. I’ll be back in a few weeks’ time with a full garden reveal from the whole makeover project and will show you how the border is developing. I can’t tell you how great a product this is. What a fantastic idea and why has it taken so long for me to discover the garden on a roll! For a novice or inexperienced gardener like me this is the ideal way to create a lovely, professional looking border. Like many I can choose a plant, based on the plant information and what I like the look of, but laying them out in the right way so those at the back have height and those at the front are smaller takes skill and experience which I just don’t have. I love that the DVD is included with lots more information on how to plant and look after the border. The seeds were a bonus for the children and we’re using them in another part of the garden. If I was going to add anything to the product I would love a detailed list of the provided plants and a care guide, particularly telling me when to prune them would be fantastic. I think this is something I’m going to put together myself for ongoing care. The 5mx90cm border I chose cost £260 but they start from a 3mx60cm at £140 all the way up to a 10mx90cm at £440. 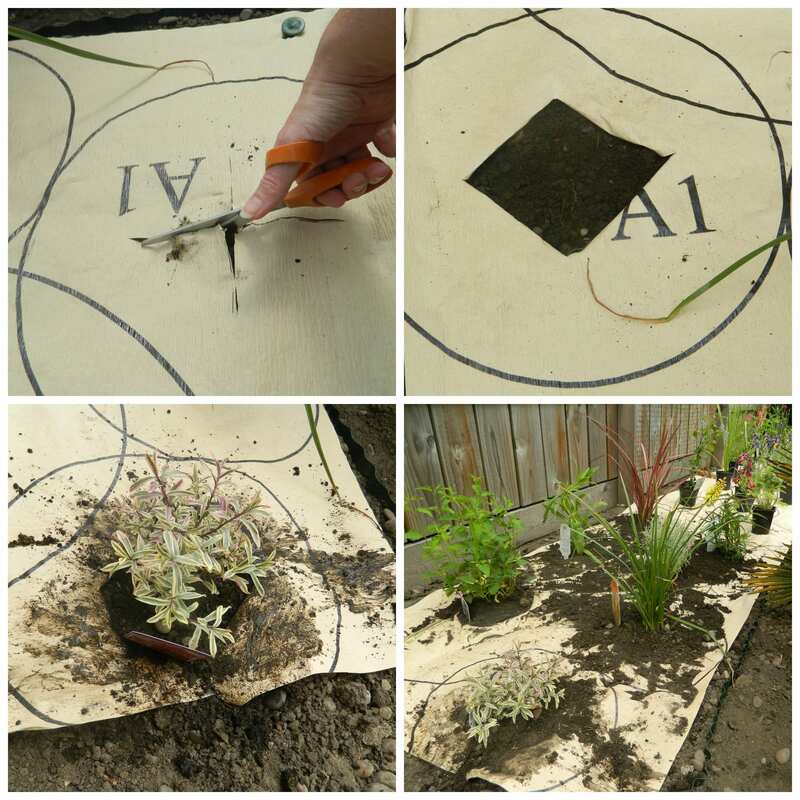 The plants seem really good quality and are a good size so it’s well worth the money. What do you think of the garden on a roll product? Further Reading: Once you’ve finished with your plants why not update add some smart outdoor lighting? I can’t tell how impressed I am with this system, such a clever idea. The plants do you look good value for money, can’t wait to see what it looks like now after a few weeks…. Are you covering it with gravel, or mulch? Thanks Amanda, it’s really come on since I took these photos actually. At the moment we’ve left it as is, but may consider gravel to ensure the weeds don’t come through. What an anmazingly useful product! Thanks Becky, I agree, so useful! What a clever idea. Good selection of plants. Can’t wait to see the finished make-over. Thanks! Yes, I’ve been really impressed with the variety of the plants. 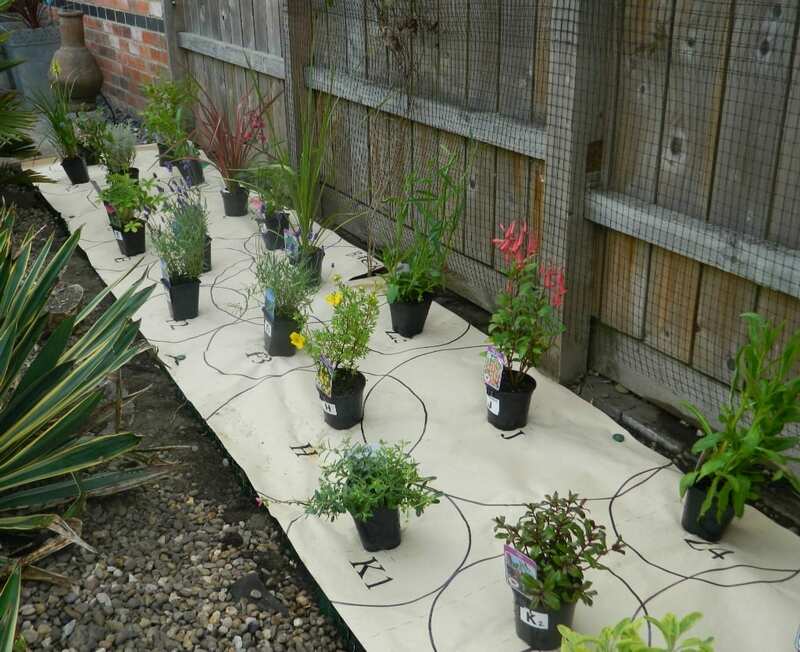 Oh I love this idea of having plants and being told where to plant them – my weakness is knowing where to put things. Garden on a roll is fab! Thanks Annie, and thanks for sharing too. It’s great isn’t it?! Thanks so much for your comment Jane, I totally get where you’re coming from and I think I’ve been there too. 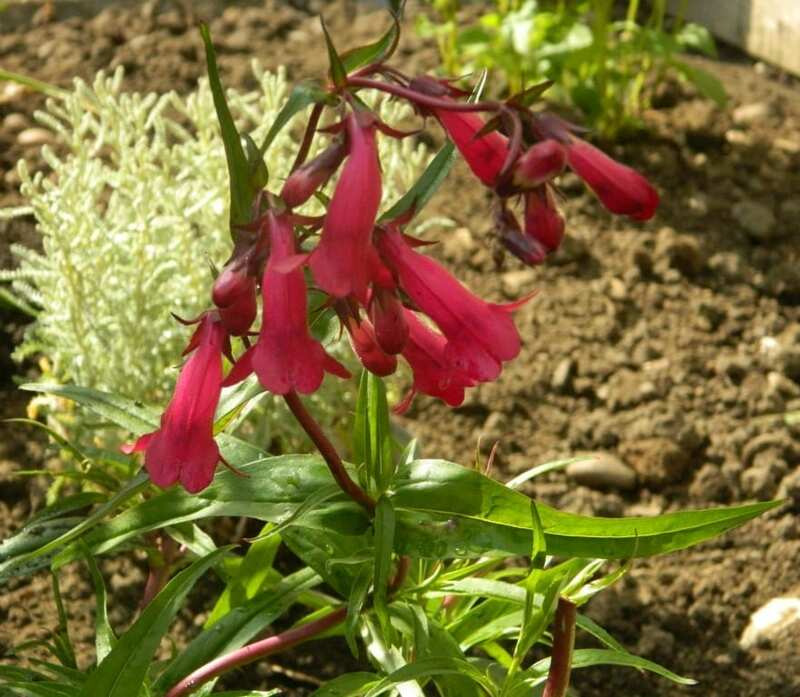 I spent years selecting plants that I loved, learning about them and watching them grow. if they were in the wrong place it didn’t matter. I guess this product is ideal for those that don’t want to do that, and after years of getting it wrong I’m excited to see how this turns out. I’ll need to do a follow up next summer 😉 Thanks for the follow. What a brilliant idea! I love that garden on a roll, ingenious! Thanks Jean, couldn’t agree more! What a fantastic idea! Even in their immature state, it looks so professional already. I can’t believe I didn’t know about this either – I have no idea when it comes to plants and just coo over ones I like the look of but never have the courage to buy them. I look forward to seeing the finished results of your garden. looks great 🙂 I love garden and house plans on paper – could marvel at them for hours. Love the mix of spikey grasses and softer textures in the herbs too, will be beautiful when they take off and start to reach out to one another. 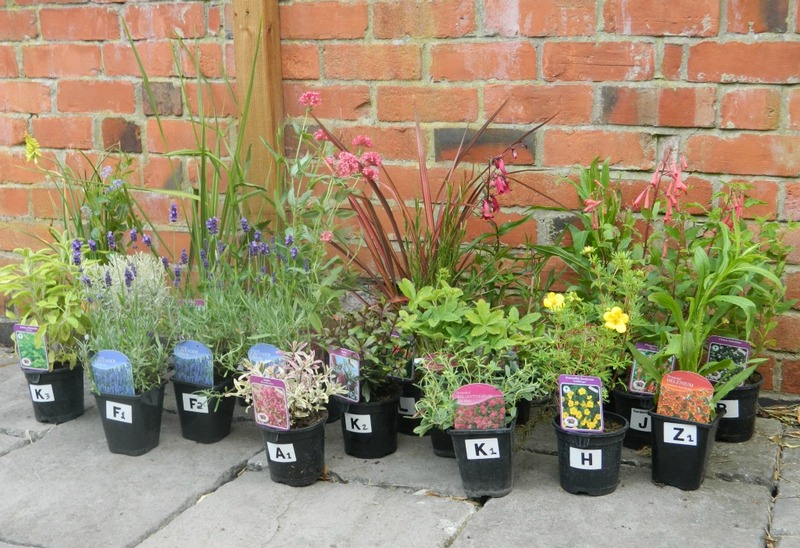 Thanks Heather, yes it looks like a really good mix – hope they all survive the winter! this is impressive!! you are on a mission and it is looking great already! How amazing is this!! I rely on my Dad for this stuff but we always end up a little lop sided. I am really thinking about using this for the border I am planning for the empty side of my garden. Great review! Thanks Penny. It’s a great product and has really changed in the short time it’s been in. Can’t wait to see how it develops next summer!